Ray Tobey of Radnor gets called “computer whiz kid” all the time, and he doesn't particularly like it. “I ignore it,” he says with a shrug. But what else do you call a guy who, at the tender age of 21 has to his credit one of the top selling computer games of all time? He's a whiz kid. Tobey is the creator of Skyfox, a full-color, combat flight simulator game that pits the pilot against all kinds of dangerous enemies in the air. Tobey is the creator of Skyfox, a full-color, combat flight simulator game that pits the pilot against all kinds of dangerous enemies in the air. Since it was released for sale about a year ago, Skyfox has garnered rave reviews from a number of popular computer magazines. What's more, according to Jill Miller of Electronic Arts piblichers, Tobey's game consistently has been one of the company's top sellers. “It's probably one of the best-selling computer games of all time,” says Miller. Tobey, who now makes his home in California, is riding high on the wave of his success, living off the royalties: in the past six months he's bought an expensive Lotus Esprit sportscar; traveled to Hawaii, Cayman, Canada and Lake Tahoe, Nev., and taken up skiing, scuba diving, photography and — his favorite — skydiving. Just how much money has he made from this venture? “I do pretty well,” he says with a sly grin. But for all of his pleasure now Tobey sacrificed a lot of blood , sweat, tears and sleep for more than three years. He went for weeks at a time without seeing another human being; he went for days without food (and lost a considerable amount of weight); he slept many times on the floor of his office, all the while working frantically to get Skyfox ready for the market. “You work until you drop, sleep for a while, work until you drop again,” Tobey says. That he literally did, after the company moved him to California. There, before a computer in the famous Silicon Valley Tobey worked two to three days at a time without shutting an eye — then camped out on the floor for six hours or so. Every couple of weeks he went to his company-paid apartment for a shower and 24 straight hours of sleep. Then, it was back to the office for another string of marathon work sessions. Long before that grueling year at Electronic Arts even seemed possible — in fact, before the company existed — Tobey was developing Skyfox in his parents' home in Radnor. 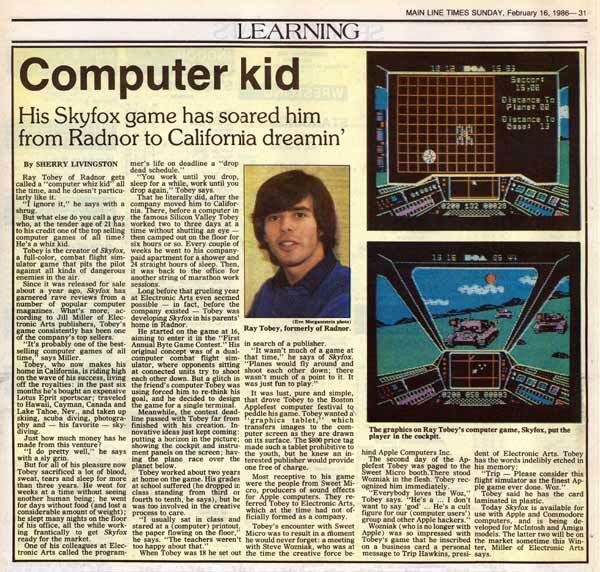 He started on the game at 16, aiming to enter it in the “First Annual Byte Game Contest.” His original concept was of a dual-computer combat flight simulator, where opponents sitting at connected units try to shoot each other down. But a glitch in the friend's computer Tobey was using forced him to re-think his goal, and he decided to design the game for a single terminal. Meanwhile, the contest deadline passed with Tobey far from finished with his creation. Innovative ideas just kept coming: putting a horizon in the picture; showing the cockpit and instrument panels on the screen; having the plane race over the planet below. Tobey worked about two years at home on the game. His grades at school suffered (he dropped in class standing from third or fourth to tenth, he says), but he was too involved in the creative process to care. When Tobey was 18 he set out in search of a publisher. It was lust, pure and simple, that drove Tobey to the Boston Applefest computer festival to peddle his game. Tobey wanted a “graphics tablet,” which transfers images to the computer screen as they are drawn on its surface. The $800 price tag made such a tablet prohibitive to the youth, but he knew an interested publisher would provide one free of charge. Most receptive to his game were the people from Sweet Micro, producers of sound effects for Apple computers. They referred Tobey to Electronic Arts, which at the time had not officially formed as a company. Tobey's encounter with Sweet Micro was to result in a moment he would never forget: a meeting with Steve Wozniak, who was at the time the creative force behind Apple Computers Inc. The second day of the Applefest Tobey was paged to the Sweet Micro booth. There stood Wozniak in the flesh. Tobey recognized him immediately. Tobey said he has the card laminated in plastic. Today Skyfox is available for use with Apple and Commodore computers, and is being developed for McIntosh and Amiga models. The latter two will be on the market sometime this Winter, Miller of Electronic Arts says.